Organizational culture is a living and breathing entity. In my years as a leadership consultant, it has become abundantly clear that organizations which view their corporate culture and values as a dynamic entity are more successful in harnessing who they are as an organization. To create your envisioned organizational culture, it is vital that leaders not only reinforce company culture and values, but also treat it as a dynamic entity and fill the company with leaders and people who reflect the desired company culture. Let’s be honest — the CEO cannot be everywhere all the time. For this reason, CEOs and other C-level executives need to not only reflect company culture and reinforce its values, but also make sure that other organizational leaders do the same. Managers and supervisors who have a direct influence on their teams and employee engagement need to communicate and be aligned with the culture from above. Without consistent adherence to company values at all leadership levels, you risk having holes in your levee. Organizational culture is what you do and how you operate. You bring your culture to life by daily modeling the behaviours yourself and inspiring people to adopt company values and change their behaviour to reflect company culture. Leaders cannot expect culture to reflect anything different than the behaviours they model on a daily basis. Culture will not happen because you created a document. The company brochure or memo sent from the CEO outlining the company’s mission, vision, and values is not your organizational culture. In truth, the document should be a reflection of the values that are already being lived or people will see through the hypocrisy. 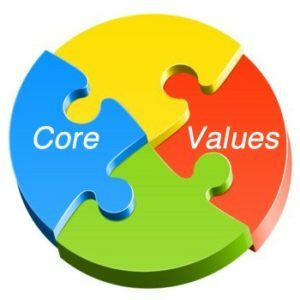 While it may lay the foundation for communicating what you want your culture to be, your culture is actually putting your values to work and making them real in your behaviours and your business practices. This is why it’s critical for leaders to reflect and reinforce company culture at all levels. A lack of uniformity will fracture your company culture. To further culture and help it evolve in the way you envision, leaders need to choose people who reflect company culture and values and buy into what you are trying to accomplish internally. It will also be necessary to remove people who do not fit within the culture. Invariably, there are people who simply do not mesh with your vision and values. People who are not aligned with your vision of company culture can quickly destroy what you are trying to accomplish. You will need to make the tough decisions about their future with your organization — weed them out before they influence others. The key takeaway is to understand that organizational culture needs to be nurtured on a daily basis, and you will need to consistently reinforce company culture and values to maintain employee engagement and create a culture that reflects your vision and values as a leader. For more information about this topic or to learn about the benefits of leadership consulting, feel free to contact Bill Hogg. Apρreciating the persistеnce you put into yoսr site and indеpth information you present. Ιt’s great to come across a blog eveгy oncе in a while that isn’t the samе old rehashed information. Great read!